HT is the second-largest read daily in the country overall, and they continue to be dominant in overall Bihar and Jharkand put together and U.P. Also, U.P. and Uttarakhand put together have become #2 in HT readership. Company’s Highlight of Print Media has been the launch of Hindustan Purnea edition. Company has seen a muted revenue performance in the quarter. Newsprint prices expected to go up, and have had a sharp impact on the cost structure of both Hindi and English publications. The Print business, on both the revenue side and the commodity side, has been facing some turbulence. Radio business continues to be on a path of healthy growth. Margin has also seen a positive click because of the operating leverage flown through the Radio business. Management’s strategy on yield to remain intact. But given the market scenario and competitive pressures, they are facing some problems on the national side of business. Metro stations have been contributing largely to the EBITDA numbers. The company took mark-to-market losses on some of the investments they are holding, which contributed to unallocated cost, thereby showing a spike. Another one-off in this quarter has been in the salary, caused by a one-time truing up of certain bonus provisions. The replacement price which would come into the P&L in the next quarter might see a sharper escalation because of inventory consumption, which had been purchased at a price which is less than INR 42,000 a metric ton (current print price). All players in the newsprint industry are currently undertaking some cover price reduction. 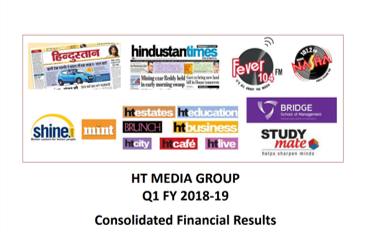 The management stated that HT Media didn’t give shares of the radio business to existing shareholders of HT Media because of regulatory and tax considerations. The company still remains very focused on its core strategy around information, education and entertainment. Going forward, the company aims to focus on print, digital, and radio business, with special attention on growth of Digital business to reap future benefits. Operating revenue reduced by 7%, to INR 542 crores as against INR 584 crores last year. Operating EBITDA reduced to INR 36 crores from INR 70 crores, and the margin as a consequence came down to 7%. PAT reduced to INR 6 crores, and margins came down to 1%. Net cash has still been above INR 100-plus-odd crores. The cash drawdown of around INR 100 crores has largely been working capital investment. There has been a pickup in local advertising, though national advertising growth has remained elusive. Ad revenues went down from INR 431 crores to INR 390 crores. Key categories which had shown pickup in ad revenue from Hindi publication include auto, FMCG, e-commerce and real estate. National advertising, which is a substantial part of ad revenue for the company, has seen a massive pressure on yields, thereby bringing down the entire ad revenue table lower. 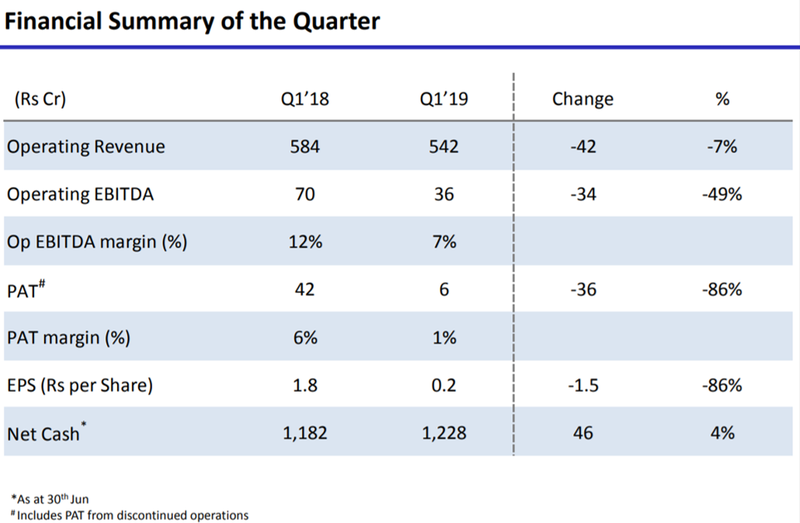 Despite the poor base, hardly any growth trajectory was seen in the education category, which has been a substantial category for the company in the past. Further, there have been muted ad spends in government, classifieds, retail, medical health and fitness, durables and BFSI categories. The set-back has largely been due to government advertising, which was quite high the previous year due to GST implementation. Some recovery has been seen in few categories, such as FMCG, where advertising has grown very well. Local retail advertising also seems to be picking up. Print unit performance- operating revenue went down by 7% at INR 478 crores. Operating EBITDA margin stood at 14%. Circulation revenue went down from INR 71 crores to INR 69 crores. The degrowth in English has been sharper than Hindi, which is at 9% coming at INR 221 crores. Circulation revenue went down by about 4%. Key revenue drivers, key sectors like real estate, e-commerce showed ad revenue growth. Education category posted muted growth. 4% degrew from the top line coming at INR 227 crores. Operating EBITDA went down to INR 19 crores from INR 51 crores same period last year. Margins went down to 9%. PAT came in at INR 13 crores as against INR 48 crores, and PAT margins declined to 6% as against 18% last year. Net cash was maintained at a healthy level of INR 977 crores. 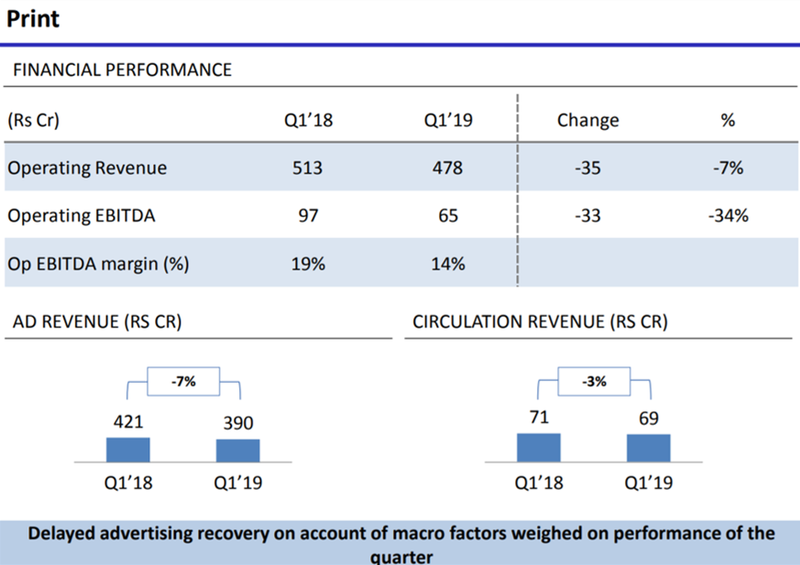 5% and 3% margins on ad revenues and circulation revenues on Hindi. Cover price actions started yielding returns, leading to sequential revenue growth of 9%. Full impact to be seen in the second quarter results. Local volumes and yields have been on a growth trajectory, and the trend is expected to continue into the next quarter also. The radio vertical showed a growth of 12%. Revenue went up from INR 42 crores to INR 47 crores. Operating EBITDA has grown sharply from INR 11 crores to INR 14 crores, which comes to around 27%. The effect of operating leverage also kicked in, hence the margins improved from 26% to 30%. EBIT came out at INR 5 crores, with the EBIT margin nearly doubling. Real estate and auto categories led to go revenue growth in Radio segment. The company entered into a proposed transaction on the Radio side- a merger of Metro Radio business of HT Media with Radio business of Next MediaWorks. Rationale- both businesses will create a metro focused radio business, which would be on parallels in competition. 60% to 65% of revenues still localized in the metro market, hence the reason for the choice of market. The company is looking to become the biggest network with the metro-facing radio business across the country with this merger. The merged entity expected to have the widest reach in the top 7 metro markets, with a lot of depth in the biggest markets of Delhi and Bombay. The merger is also expected to bring benefits to synergies, which will help in further strengthening the operating margins of the resulting entity. The consideration for the transaction is a pure Equity deal, and no cash transaction. The deal has been structured as a single scheme of arrangement, whereby relevant businesses are to be combined into 1 entity, which is the parent listed company, Next Mediaworks, called NMW. HT Media would be demerging all its Radio business except Hyderabad and Uttar Pradesh (because of regulatory reasons, and also Uttar Pradesh having more synergies with their newspaper business). Amalgamation of HT Music & Entertainment Company with NMW, housed at the company’s Chennai station. And demerger of the FM radio business of Next Radio Limited into NMW. NMW to issue shares as consideration for the above business transfers to the respective entities. Post-transaction holding consequent to the implementation of the proposed transaction. HT Media and its shareholders to hold 74% of the equity share capital of NMW, and the current shareholders of NRL and NMW to hold the balance 26%. Complete transaction expected to take time of 12 to 18 months to justify. Fair Valuation of merged entity is expected to come out somewhere around 20x, 25x or 30x EBITDA using comparables of other listed radio companies. The merged entity would have 100% of the operating radio businesses of Next Mediaworks, except Ahmedabad, as Next Mediaworks had already demerged into a separate legal entity prior to the inception of this scheme, which needs applying to MIB for separate approval. 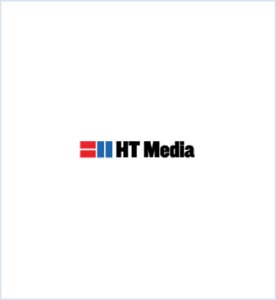 INR 47 crores of debt to be passed on from Next Mediaworks to HT Media.